In the end, Ohio State ended up knocking off Oregon by nearly as wide a margin– 42-20– as the one by which Oregon defeated Florida State in the semifinal round. Oregon only surrendered one turnover, a garbage-time Mariota pass on the last real play of the game, while the Buckeyes had four. On a final viewing note, I thought ESPN’s Megacast was a success once again. I spent most of the second half toggling between the film room on ESPN2 and “off the ball” on ESPNEWS. Vanderbilt head coach Derek Mason was the prescient star of the former, along with Pat Narduzzi, Michigan State’s outgoing defensive coordinator on his way to the head coaching job at Pitt. The latter was even more technical, but the marking up of plays on the all-22 shot as they ran in real time was informative and neat. To the extent viewers found these two simulcasts boring (to say nothing of Classic’s “sounds of the game”! ), that finding serves as a reminder of how many lulls there are in today’s traditional football broadcasts. Indeed, I found the break from the time-filling, faux-mythologizing to be something of a relief, particularly as Chris Fowler, in his apparent and quiet succession to the Musburgerian throne, drifts further toward the Nantzian realm. 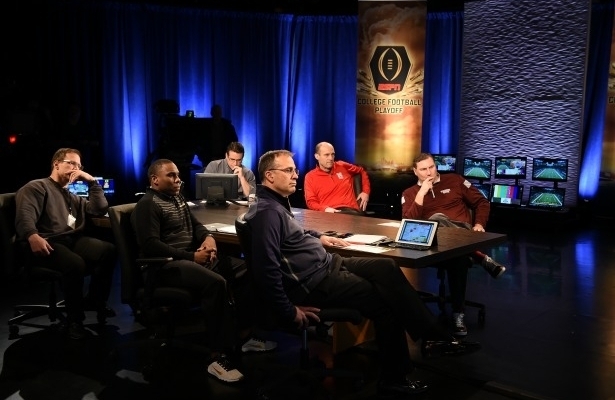 Thanks to the College Football Playoff, or at least to the playoff structure, fans also are relieved from the rote, annual what-if conversations about teams not included in the BCS national championship game. As much as it pains us all to say it, Ohio State feels like a legitimate national champion. This entry was posted in ALDLAND and tagged bcs, brent musberger, cardale jones, cfp, chris fowler, college football, derek mason, espn, ezekiel elliott, florida state, jim nantz, luke fickell, marcus mariota, mark helfrich, michigan state, ohio state, oregon, pat narduzzi, pittsburgh, television, vanderbilt by AD. Bookmark the permalink. Going for it on fourth down: I wonder if coaches do this more often now than, say, 5 or 10 years ago. I feel like admitting that you might go for it on fourth down changes the game plan on third down. Then, third and 5+ is no longer a guaranteed throwing down, opening up more things.